This Sunday afternoon, Oct 26th at 2PM: where the Dead River meets the Alapaha River and goes underground at the Dead River Sink, aka the Alapaha Sink. Park on SRWMD’s Jennings Bluff Tract and walk in with WWALS to see what Samuel Taylor Coleridge dreamed as “Where Alph, the sacred river, ran Through caverns measureless to man Down to a sunless sea.” No boat required: this is a walking outing. …the hike to the sink does have some steep parts, especially if you go the scenic route, which I recommend. The area around the sink itself is kind of steep with slick mud/clay. So wear good shoes for hiking. There were only a few Mosquitos. The area is beautiful and worth the effort. This event is FREE! All we ask is that you are a current member of WWALS Watershed Coalition. If not, its easy to join online today at http://wwals.com/blog/donations/. You do not have to be a member to come on this outing. If you like the experience, we recommend that you join to support the efforts of WWALS. WWALS is an advocacy organization working for watershed conservation of the Willacoochee, Withlacoochee, Alapaha, and Little River Systems watershed in south Georgia and north Florida through awareness, environmental monitoring, and citizen advocacy. 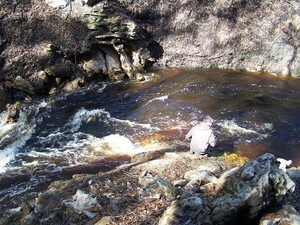 The Alapaha Sink is one of the sites on the Alapaha River Water Trail that WWALS is developing. Thanks to Hamilton County Tourist Development Council and Board of Commissioners for their support for the Water Trail. Your membership can help support WWALS as it develops the Alapaha River Water Trail. Location: 30°34’01.3″N 83°02’21.1″W or 30.567035, -83.039202 (thanks to Great Florida Birding & Wildlife Trail). Here are directions from Lakeland, GA, Tifton, GA, Valdosta, GA, Gainesville, Fl, Live Oak, Fl, Tallahassee, Fl, and Jacksonville, Fl. 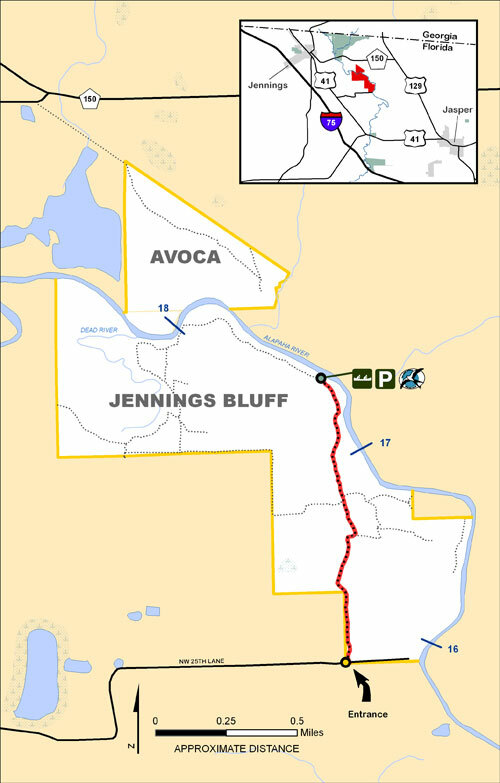 Once you get to Suwannee River Water management District (SRWMD)’s Jennings Bluff Tract, you can see on the map below that you then drive about another mile north to get to Jennings Bluff Launch, and keep going for another half mile or so to park near the Sink. Same as for Tifton, GA.
Or go south on US 41 instead. Head north on I-75, and then the same as for Tifton, GA.
Then the same as for Tifton, GA. This entry was posted in Outing, River and tagged Alapaha River, Alapaha River Sink, Alapaha River Water Trail Committee, Alph River, cave, conservation, Dead River, Dead River Sink, Deanna Mericle, Florida, Georgia, Hamilton County, Jennings, Jennings Bluff Tract, John S. Quarterman, karst, Kubla Khan, limestone, Lowndes County, north Florida, Outing, river, Samuel Taylor Coleridge, south Georgia, SRWMD, Suwannee River Water Management District, watershed, WWALS, WWALS Watershed Coalition on October 24, 2014 by jsq.